The tram stop is next to the hotel. 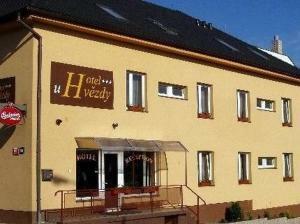 Hotel U Hvezdy is a 10-minute drive from Prague's Ruzyne Airport. Guests can benefit from the 24-hour reception at the U Hvezdy. All rooms have an en-suite bathroom and a satellite TV. Some of them offer free Wi-Fi and there is also a free internet station in the lobby. Hotel U Hvezdy is close to a local supermarket and there are various bars and restaurants nearby.